Kings Road Apothecary's Deep Woods: Conifer Body Oil came across my nose about a month or so ago when my friend Jean told me how amazing it was and generously sent me a sample to try out. Uncapping the sample was like opening up Pandora's box, a whole Pacific coast coniferous forest sprang up around me, verdant and lush and teeming with life. A blend of organic jojoba, avocado, sunflower, sweet almond and coconut oils fuses with pinon, White fir, Douglas fir, hawthorn and spikenard to brew up a stimulating potion that will help with circulation and skin conditioning. 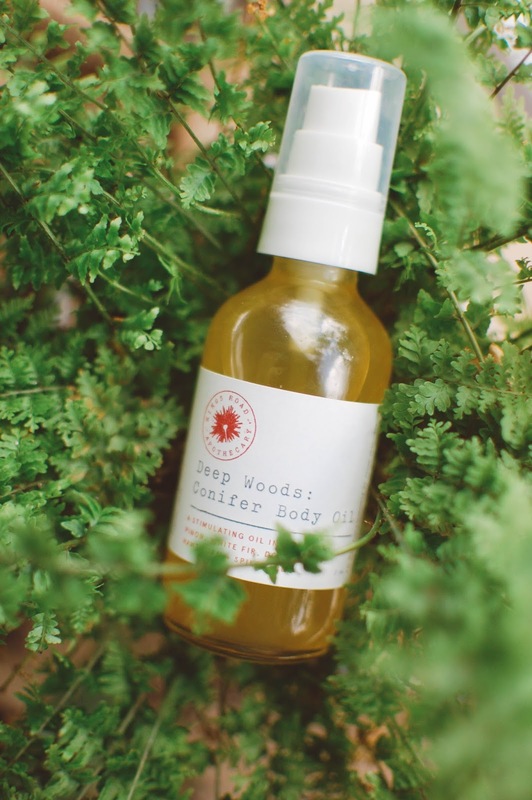 The resinous and golden frankincense tones of pine needles and cedarwood and evergreens cascade over the skin and over the senses when I apply this to my chest and arms and neck and anywhere that needs extra love and moisturizing. It is a beautiful compliment to many of my pine based perfumes as well, like Arcana's Filthy Viking and Forest Witch (all natural), Solstice Scents' Pinyon Truffle and Sonoma Scent Studio's Pacific Forest (which is all natural too). This glass 2 ounce bottle is $26 and handcrafted by Rebecca who owns and runs Kings Road Apothecary out of Southern California. Rebecca harnesses her knowledge of botanicals and harvests most of the plants used in her products by hand in Southern California. 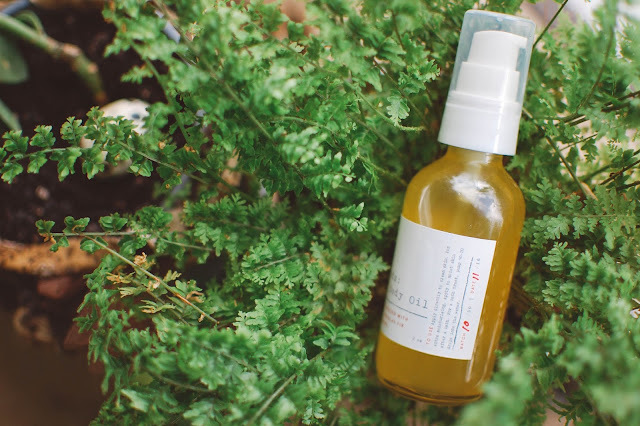 Wildharvested organic plants feature in everything from teas to body oils and elixirs to bath salts. I am thrilled with this first purchase from her and have gone on to buy my first Surprise Box from her in the Tulsi, Pinon and Wood Smoke edition. I highly recommend reading her blog and signing up for her newsletter. You will get great information and a 10% off coupon code (which I did use towards my box). Have you tried Kings Road Apothecary? Do you use elixirs or digestive bitters? Ooh, that box sounds divine!! Looking forward to hearing about it. I read about Rebecca on Britton's blog or Instagram and needed this after I was too late for Britton's oils. I hope she is able to bring back some of her cedarwood oil, it was one of my favorite notes in HoG products. Btw have Lynda or I mentioned wildcrafted perfumery Juniper Ridge? Lynda is a fan, I tried one product, a room spray, and it was just okay for me but have thought about trying a cologne sampler in the past. Lynda's favorite was their soap I think. Yes ma'am. I have a feeling I will be in for a treat. I have a cart with some tea and bath stuff in it right now I am trying to thin out. Wish me luck. I am hoping Britton is able to figure out a way to continue with Blood Moon too. I was reading today that she was unsure of doing lotions due to space and internet issues but she was still wanting to do perfumes? And something about textiles. Whatever she makes I am pretty sure I will buy it. She could sell crocheted maxipads and I would probably be in line. Juniper Ridge! Yes! I have their site earmarked on my phone for my next random rainy day splurge. Specifically their Douglas Fir tea and campfire incense sticks were on my list. I will see if they have soap too when I order. Thanks for reminding me!! I've nominated you for the One Lovely Blog Award! The info is on my blog. I am going to try to do some catching up on reading soon, busy cleaning and getting for the in-laws coming tomorrow! Have a lovely weekend! This oil sounds so divine; I'll have to check this brand out!! You should! Rebecca handcrafts and wildharvests a lot of her ingredients and spends thoughtful time and consideration into concocting her offerings, often for the whole body and mind betterment. Mmmmmm! Spruce and clary sage sounds like it would bring clarity and calm. I am loving all those notes it has in it!! Do you use it as a body oil? Lately I have been using them on my face and in my hair for nice results. Only the all natural ones though. I mostly use it as a body oil, sometimes on my face and it can be used in a bath- I haven't tried that one yet.